Gain the ability to assess your health yourself, and the knowledge you need to proactively improve it. Measure and track your health using at home finger-prick blood test kits. Buy affordable blood tests to help you identify health issues and achieve your fitness and well-being goals. By making it easy and convenient, and giving clear guidance and advice, we enable you to proactively check and manage your health. Are analysed exclusively with the largest independent clinical laboratory in the UK with over 30 years experience. As trusted by NHS hospitals, private clinics & general practitioners. A team of 16 consultant doctors are responsible for laboratory clinical governance. UKAS accredited (ISO 15189) laboratories run 24/7 to deliver results fast. All home blood tests are CE marked and processes meet & exceed Clinical Pathology Accreditation (CPA) and NIHR GCP standards. Tested from home with no need to make an appointment or take time off work. Discreetly packaged free delivery with everything you need for a finger-prick blood test. Receive confidential reliable test results within 24 hours. No more chasing doctors for your results. Personalised explanations and evidence based recommendations ensure you fully understand your body. Make positive changes, track them over time and understand what healthy lifestyle measures are working. We focus on preventable diseases which cause the majority of premature deaths. The ‘big three’ healthy lifestyle risks include diabetes testing, checking cholesterol levels and liver function tests. You can also assess hormonal issues such as thyroid function tests, fertility tests or menopause testing, determine nutritional deficiencies with vitamin and minerals tests or screen for common sexual health (STI) concerns. We've selected appropriate tests for home sampling, so that professional analysis methods can be used on your sample. In fact, your blood is sent to the same accredited clinical labs that the NHS use. 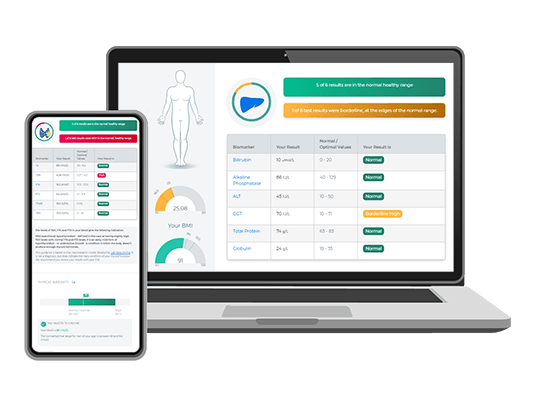 So you can be confident that your results will be accurate and comparable with the tests you receive from your doctor. When you fully understand your body you can adapt your lifestyle and make real changes to improve your health. Health profiles are selected professional diagnostics tests created to help you meet your health goals. They help you track essential biomarkers over time and are available as a subscription. Target key lifestyle risk factors you can measure, act and improve on. Target your health needs by selecting specific tests to identify risks & give actionable results. The big three health risks - diabetes, heart disease & liver disease - are great overall health indicators. As these risks can be reduced through better lifestyle, they are also ideal as an ongoing measure of your improvements. Complementing lifestyle factors, this range provides the status of your blood health and of essential vitamins & minerals. Enabling you to identify deficiencies or reassure of good health on an ongoing basis. Sometimes we all feel a bit under the weather, often caused by stress, ongoing infection or other concerns. These tests help you understand your risks here - if you have symptoms please ensure to speak with your GP. Growing old is inevitable, ageing well may not be. Understand your risk from age related conditions including arthritis, osteoporosis and the menopause. Human fertility can be a frustrating process. If you're struggling to conceive it helps to rule out underlying hormonal balances for both men and women. Your sexual health is critically important but testing can be an unpleasant & embarrasing process. We provide only the highest sensitivity detection methods that you can sample for from home, with a rapid turnaround & discrete service.